Tradition is an important part of life, for some people traditions govern their lives. But for most of us traditions remind from us where we came from. For anglers traditions are about that special annual trip with family and friends, a favorite rod or a smelly old hat. These are the events and items that give our passion meaning and depth. Bar fishing the upper Fraser River for Salmon is for many, a time honored tradition. As far back as any one can remember bar fishing and the Fraser River have been synonymous with each other. Before the fairly recent advent of bottom bouncing on the Fraser 90% of anglers pretty much exclusively use to bar fish when they hit the upper Fraser River for Salmon. The last 10 years have been a whirlwind of activity, discovery and controversy when it comes to the Salmon fishery in the Fraser valley. So many new anglers have come into the sport and many have only tried bottom bouncing. Many regular bar fishers also over the past decade had gravitated to the new style of fishing and set aside there bar fishing gear to pursue the new and exciting bottom bouncing fishery. But as things tend to go, everything that is old is new again and the traditional style of bar fishing has been making a comeback the last few years. There are several good reasons for this, first you just can't keep a good tradition down for long, and second this is a great way to fish! Once the rods are in the holders its time to relax, build a fire, socialize with friends and of course eat! The best reason however is this technique really catches fish; no question about it bar fishing under the right conditions is very effective. If you spend a little time to learn how you will be surprised that you can hook as many and often even more fish than if you were bottom bouncing, no kidding. Chinook Salmon are the primary target for most bar fishers. Chinook salmon can be caught bar fishing from May in to November. The Fraser River has a very long season but the river conditions will vary from season to season and Month to month. The month of May is usually a hit and miss proposition. Some years in May the river has good visibility and some seasons not. May is also the month that the spring run-off starts so the Fraser River will rise and become full of debris and have very poor visibility. The Chinook runs are also up and down in May, some years good and some not so good. June is really the first good month for bar fishing. Usually around the middle of the month the Chinook start coming in respectable numbers and during most normal seasons the Fraser is now on the drop with water visibility improving to the point that makes bar fishing worthwhile. July is usually one of the best months of the year. The Fraser is continuing to drop and the Chinook runs are usually very strong. Their are more and more bars to explore as the river gets lower and lower. August also has very strong runs of Chinook and the water levels and water visibility is usually good. August is also the month that the Sockeye fishery opens. During this time bar fishing can be difficult because there are so many people bottom bouncing and the two styles don't mix. If you want to bar fish at this time be prepared to seek out a spot away from the mass of people. Once the Sockeye fishery closes things will really quite down and there are plenty of spots from which to bar fish. September has some excellent opportunities as the fall runs of salmon start to show up. Chums, Pinks and Coho can all be caught bar fishing and don't be surprised to see the odd Thompson River Steelhead as well. October will bring much of the same as September but the fall run white Springs can be huge! Some of these fish can reach weights of over 60 pounds and 30-pound fish are commonplace. In November bar fishing does slow down but during the first half or so it is still worth a try for some late run Springs, Chums or Coho. Bar fishing the Fraser River is relatively straight forward, but as with all types of angling there are details that need to be dealt with properly to be successful. Bar fishing gear can basically be broken down into two distinct groups; upper river gear and lower river gear. Below the mission bridge the Fraser runs much slower and the river is actually considered tidal waters. Because of the slower currents the gear required is much lighter. This article will deal with the upper river the waters basically from Mission to Hope. The upper Fraser River differs greatly from the lower as the water is much faster and there are many more gravel bars to fish from and the waters where the fish run are usually much shallower. Because the Fraser river is so fast the fishing gear required will have to be very stout, we are fishing for powerful fish in the prime of there life in very swift water. Wimpy gear will just not get the job done. I cannot emphasize this enough. A good bar fishing rod should be between 10.5 and 12 feet long. This should be a heavy action rod capable of casting 14 to 18 ounces of lead and able to handle 30 to 60 pound test line. This is not over kill if you fish any thing less you will lose many fish and much tackle. I have had many Chinook in the 20 to 30 pound range make several long runs and take 25 minutes to land with gear such as this. Reels also must be stout, spinning reels will work but bait casters are preferred. There are many anglers who still fish "old school " with single action reels but this is not recommended for anglers starting out with there first set up. Reels need to be loaded with at least 200 yards of 30 or 40 pound test monofilament. Personally over the last few seasons I have switched over to braided line for bar fishing and have found it to fish much better. Braided lines have almost no stretch and that makes for faster hook sets. Braided lines also have much smaller diameters so with a braided line you can fish a 50 or 65 pound test line that is much thinner than a 30-pound test mono. This thinner line will allow you rig to sit in faster water with less weight than mono, this is a big advantage. Braided lines are two to three time more expensive than mono but they also have a much longer life span. The terminal tackle for bar fishing is basic but important, attached to the end of the main line is a heavy-duty spreader bar this separates the leader and weight from the main line and greatly reduces tangles when casting. The lead weight is attached to the bottom of the spreader bar. Wedge style weights weighing 14 to 18 ounces are required to anchor the rig to the bottom of the river. Your leader is attached to the arm of the spreader bar and should be no less than 30 pound test monofilament, personally I use 50 pound test this does in no way deter fish from biting because the Fraser always has some color to it so the fish are not leader shy. Keep in mind Chinook salmon have very sharp teeth and can easily chew threw mono, so beefing up your leader will absolutely help you put more fish on the beach. Leader length should be about 36 inches. The business end is comprised of a spin and glow size 0 or 00. Colors vary greatly but if in doubt go with metallic finishes, I am particularly fond of the chrome body with the green top and Mylar wings. After the spin and glow add three large salmon beads to space the hook back and away from the spin and glow. Always use top quality hooks I use size 7/0 for the 00 spin and glows and 6/0 for the 0 size. A good little trick is to add a small salmon bead above the spin and glow and then with a piece of 30 pound test Dacron tie a stopper knot above the salmon bead. This will stop the spin and glow from riding up the line and tangling while casting and will also keep you lure and hook right together in the water while fishing. The final piece of you tackle is a good rod holder; standard spike styles that hold the rod almost strait up about 3 to 4 feet off the ground are prefect. Make sure that this is also sturdy and well placed into the ground because more than a few rods have found there way into the river by being pulled out of there holders by big fish. Many anglers use just straight plain spin and glows for bait and this works well but many others do feel that buy adding Salmon roe or even Ghost shrimp you may get more bites. Jack springs are definitely attracted to Roe. Another option for anglers is to try adding a scent to your spin and glow. There are many commercially available scents from herring to sardine to shrimp and of course roe. I have personally had very good success with the addition of scent to my spin and glows and now I don't bar fish with out them. 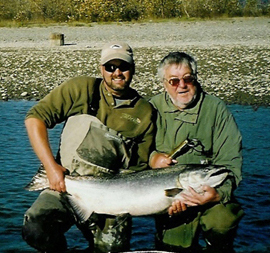 There are many very good locations to bar fish the Fraser River from Mission to hope, some of the more popular are Bowman's, Grassy, Upper and Lower Wellington, Queens, Peg leg, Ferry Island, Herrling Island and Spring Bar just to name a few. The most important factor to keep in mind when choosing a Bar fishing spot is that you will need the proper water speed, usually a brisk walking speed will do, also the proper bottom is very important. A good gravel bottom with rocks ranging from the size of a plum to the size of an apple is perfect. Stay away from sandy bottoms. Most of the fish will run in depths from 4 feet to 10 feet. When looking for good spots to bar fish find bars that meet these three criteria and most will produce fish. The Fraser River is a very special place; when you live here you do tend to take this for granted. Because I make my living on the river as a professional fishing guide I get the opportunity to fish with anglers from all over the world and let me tell you they are blown away by the fishery that we tend to take for granted. Where else in the world can you have fishing like this in such close proximity to a major world-class city like Vancouver? I do not know. The past twenty years has seen the Fraser River go from a little utilized resource with limited fishing opportunities to thriving fishery with many different angling opportunities. This is no accident the fishing we now enjoy has been made possible through the untiring and unselfish work of a few dedicated anglers who were just not satisfied with the lack of respect and dismissive attitude that the Department of Fisheries and Oceans had with the anglers and the sports fishery on the Fraser River. In 1980 The D.F.O decided to close the Fraser River to the retention of Chinook salmon despite the fact that that these same fish were still open in the Salt water, but because of controversy and political pressure from other user groups at the time the Department of Fisheries and Oceans made a political decision to close the river. This decision was unfair and served no real propose, for several seasons anglers were not allowed to fish the Fraser for Chinook. Several local anglers were very upset by this and during the spring of 1984 formed a group called the Fraser Valley Salmon Society. The two anglers who initially started this group and should be credited for getting the ball rolling were Chris Gadsden and Fred Helmer Jr. These two anglers with the help of others over the years ( Fred Helmer Sr, Pete Sellmer, Sandy Richie,and Bill Otway ) Worked tirelessly to lobby and pressure the elected officials and the D.F.O of the day to reopen the Fraser River and allow a sport fishery. In 1985 their efforts won out and the Fraser was again open to Chinook. These anglers were not done how ever and have been working ever since to get more and more openings for sports fisherman. The Sockeye and Pink and Chum fisheries that we now enjoy are due in part to the continuing efforts of the Fraser valley Salmon society and to this day they continue to go to bat for us every season. Check out the Salmon society they could sure use your support after all they are working for us http://members.shaw.ca/fraservalleysalmonsociety/. Bar fishing the Fraser River is a very pleasurable way to spend the day. Once you have cast you rod and placed it in the rod holder its time to sit back relax, eat, socialize or start a campfire. This is the calm before the storm because once that fish hits its pandemonium! 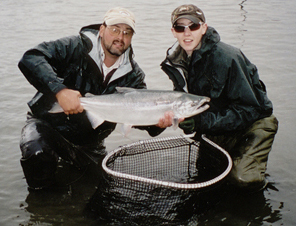 Fraser River Salmon are very strong fish, the thrill of catching one draws people from all over the world! We are so fortunate to have such a strong and diverse fishery right here in our own back yards. The outlook on the Fraser River is very bright! The Fishing over the past six or seven years has been better that anyone has seen in a very long time. Get out there enjoy this fishery its one of the best in the world! Who knows you just might start a new tradition.